Did U.S. Special Forces kill a giant in Kandahar (Kandahar Giant)? In the summer of 2016, several personalities and web sites dedicated to discussing supernatural myths and conspiracy theories began claiming that an American Special Forces soldier serving in Kandahar, Afghanistan, was killed in 2002 by a 1,100-pound, blade-wielding, 12-foot-tall giant from Old Testament times before the giant himself was taken down by the military. We do not have any record or information about a special forces member killed by a giant in Kandahar. Current interest in the story appears to have been generated from a video created by L.A. Marzulli, an author, blogger and filmmaker determined to link modern times with biblical creatures and prophecies. On 13 August 2016, he posted an episode on YouTube of his series, Watchers, in which he claims to interview a military contractor or soldier who witnessed the blade-wielding “Giant of Kandahar” kill another soldier before being downed by troops, whisked away by a transport aircraft and hidden away from public view. Marzulli makes the case that the giant was a Nephilim, which were described in the Book of Genesis as offspring of gods and human women who inhabited Canaan at the time of Israelite conquest. But when it comes down to details, he’s vague, saying he interviewed the unnamed man at an “undisclosed location” on an unknown date. The interviewee who he claims shot and killed the giant, doesn’t give any details on the location of the alleged incident, other than to say it was a “remote” location in Afghanistan in 2002. He claims he and others were sent in to look for a missing patrol when they saw a scarlet-haired giant emerge from a cave and skewer his friend, who he called “Dan,” with a large blade. If the Army’s statement isn’t sufficient, the only service member with the first name Dan or Daniel who died in Kandahar in 2002 was killed — along with three others — in an accident involving the clearing and disposal of explosives. There are no incidents on the Department of Defense press release page, in which all military casualties were listed, involving a giant. Likewise, there are no reports of an entire patrol disappearing in Afghanistan. 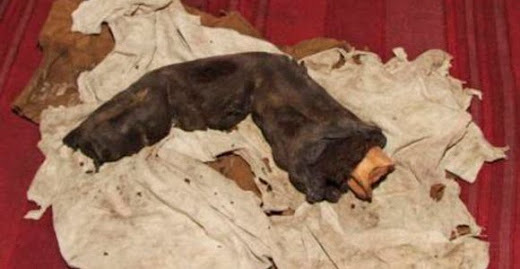 A 38-centimeter long finger found in Egypt: Evidence of the Nephilim? The images of a giant finger, 38 centimeter long has researchers clueless as they state that something like this is impossible. According to science, it is impossible, yet, the finger found in Egypt seems to be the real deal, as the finger even has a certificate of authenticity and X-Ray images. Could this be evidence that points towards the existence of giant beings that walked on Earth in the distant past? 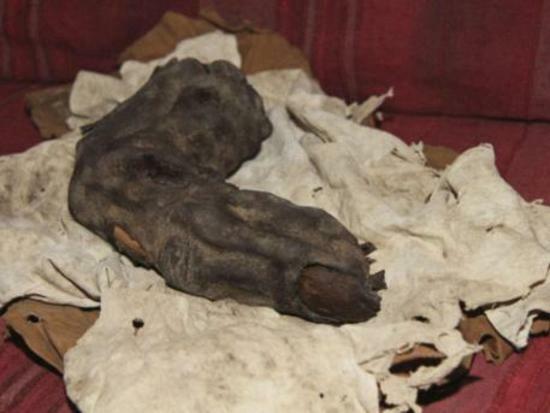 The remains of this finger are impressive, it is a huge mummified humanoid finger that hast 38 centimeters in length. 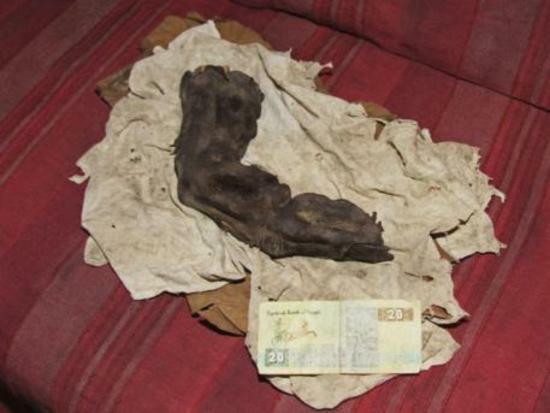 Researchers from Egypt believe it had to belong to a creäture that was over 5 meters height. Only a few people got to take images of this incredible artifact in 1988. The owner of the giant finger was, according to Gregor Spörri, a grave robber that acquired the piece while searching through an undisclosed thumb” in Egypt. When Gregor Spörri, a 56-year-old entrepreneur offered to by the finger, the owner responded: NEVER. 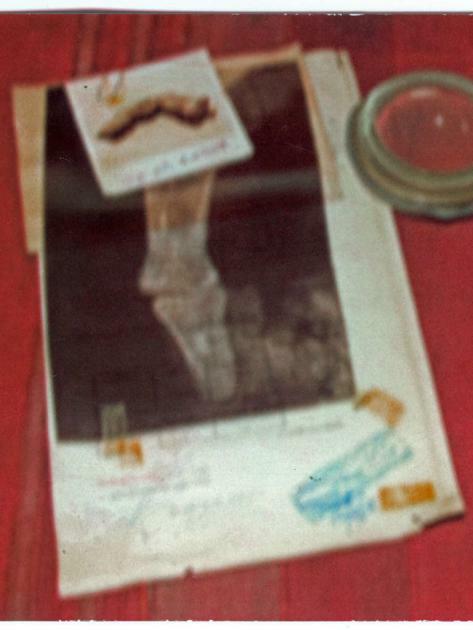 According to Gregor Spörri, the grave robber who found the finger also had a certificate of Authenticity and an X-ray image, both of which are from the 1960’s. After Spörri left Egypt he wanted to know more about this incredible relic, he wanted to find out where the rest of this giant creäture was located. He returned to Egypt in 2009 compelled to learn more about it. Unfortunately, by then, the old man who allowed Spörri to take pictures of the giant finger had vanished, and with him all traces of the mysterious finger that has scientists and researchers scratching their heads. Now, all that is left are these few images that are mind-blowing and stories and myth of creatures that once, in the distant past, walked among human beings. Researchers have had mixed feelings when it comes to this mysterious ancient relic. The biggest problem is that, the finger does not fit into any conventional theories presented by archaeologists or historians, it simply put, impossible. Is this enough evidence to finally conclude that giants did in fact walk on Earth in the distant past? And that the mysterious gigantic footprints found in different places on Earth are real?